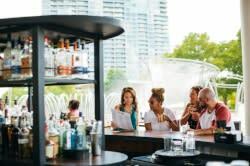 The space is divided into a large bar area with an island feel and a dining room that benefits from lots of natural light and playful decor. 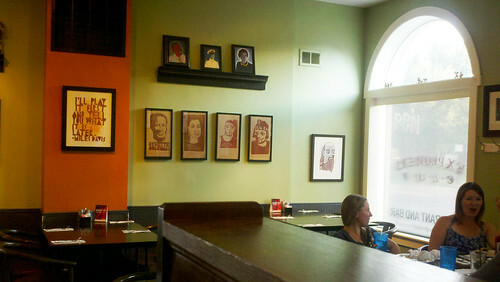 I think I saw a painting of a zombie Eleanor Roosevelt. Service was friendly, attentive and calm all at the same time. Food came out very quickly. There are so many great things on the menu that it was difficult to choose. We started with fried okra and plantains to start - both with dipping sauces that complemented the ingredients without overpowering them. I&apos;m a big okra fan - but only if it&apos;s cooked right, and this was perfect. 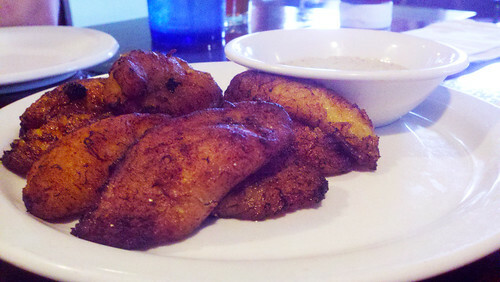 The plantains were of the more ripe, sweet and soft variety, and were caramelized nicely. Entrees were a tough choice - my dining companions and I ended up with the Mofongo Sandwich - pulled pork with smashed plantains, jalapeno slaw and roasted garlic: A great mix of savory, spicy and sweet. It came with a side of fries which are exactly the type I crave. 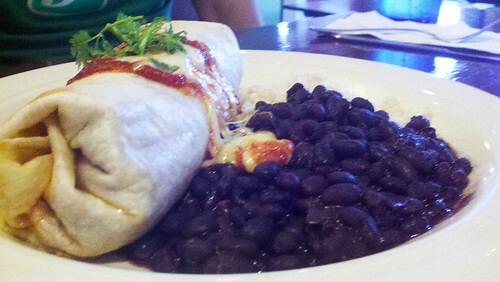 The burrito was sized generously, and came filled with chicken, re-fried beans and veggies. The re-fried beans were the real star of the dish. 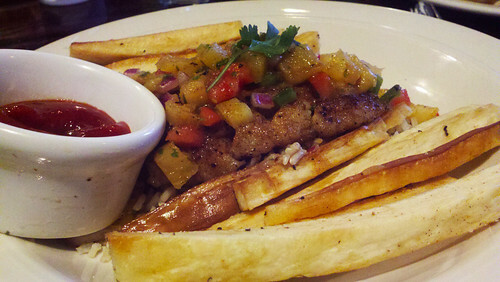 I ordered grilled snapper with mango salsa, which came with a side of delectable fried yuca. The flavors took me back to my last beach vacation - and at $12, it was a tremendously good value. When I looked at the menu, I was excited to see that Explorer&apos;s Club has weekend brunch service! I&apos;m already looking forward to my next visit! Have you tried Explorer&apos;s Club yet? What dishes would you recommend?